Saving our Future Generations: Our kids have a shorter life span than us and it needs to change! How does that one saying go? I think it is a very true phrase, and it is something that we all need to start to embrace. This world needs more people trying to change it for the better. There is a certain stigma on those that preach natural healing and whole food nutrition and it needs to stop! We’re often seen as science deniers, or tinfoil hat wearing hippies. This attitude towards us makes us ONLY speak to people that have similar views on the world which prevents us from helping others that may actually need or want our help. I’ve been guilty of this as well because I am tired of arguing, or getting “that look” from a friend or family member. There was an article from Moms Across America the other day that just completely shook me and this information needs to be shared far and wide. I’ve seen the statistics in various places before but seeing them altogether like this just makes me so ANGRY. The one statistic missing from this is that the leading cause of death of children ages 5-14 is CANCER. 1 in 5 children will get a diagnosis of cancer now. 1 out of 2 children born in 2032 will be diagnosed with autism. 80% of households with a child with special needs will result in divorce. Toxin exposure is the number one cause of a majority of these illnesses. There are over 80,000 “approved” by the EPA that can be found in our food, water, personal care products, and more. Enough is enough. Our children are worth more than this. 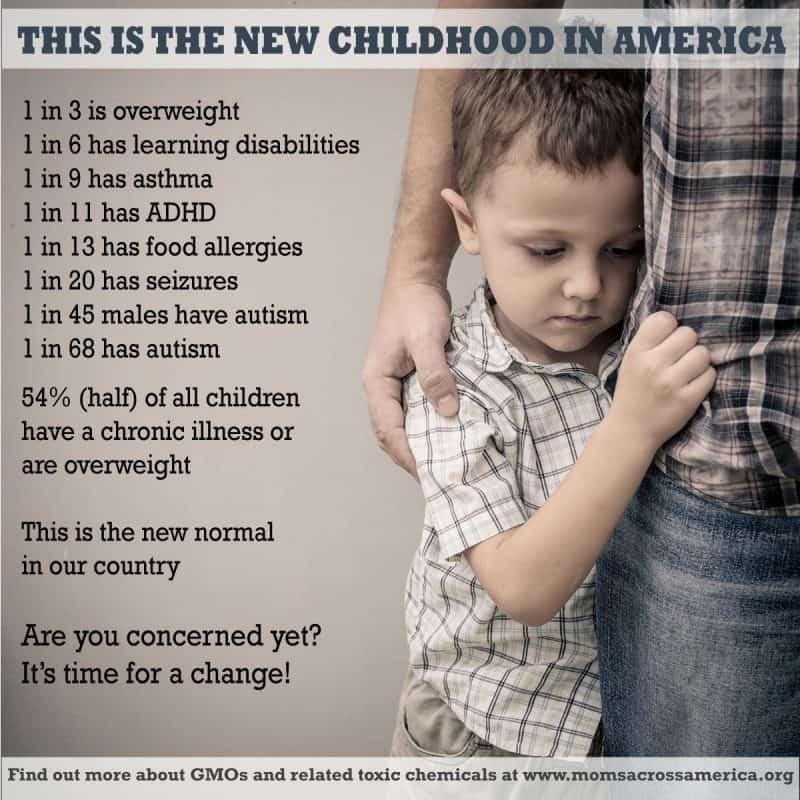 Forget about all of the crap that is “normal” in this day in age: mercury dental fillings, food that is marketed directly to kids with artificial coloring and massive amounts of GMO sugar, toxins in vaccines and the fact that the vaccine schedule these days is absolutely horrendous, antibiotics at every sniffle, medications for supposed behavior problems in TODDLERS. ENOUGH! Let’s be the change, not only for us, but for our children. Enough of the fact that this “lifestyle” is frowned upon by those that see no issues with anything above. Let’s get back to basics, back to common sense, and back to real health. It is nearly impossible to avoid everything in this toxic world, but there is PLENTY we can do to help. How can we start to make changes? Go for organic or at least non-GMO whenever you eat. Supporting local farmers is even better. No food coloring, no MSG, no artificial ingredients, no refined sugars or carbs. Pay attention to what your child reacts to since some have genuine issues with wheat or dairy. Ditch as much plastic and non-stick cookware as you can. Go for glass, stainless steel, and cast iron. Even some silicone is better than the non-stick junk. Replace all of your household products with toxin-free products. This includes make-up, soap, shampoo, toothpaste, dish soap, window cleaners, etc. Everything that you can think of that is probably full of harsh chemicals should be on your list to replace. Poofy Organics is one of my favorite brands for organic and toxin free products. Most health food stores will have good choices as well. Check EWG.org for more information on the chemicals to avoid and product recommendations. Use the *best* water source you can. Get a filter, use spring water, or make sure your well water is free of contaminants. Read my post on how to get clean water. Find a family doctor or pediatrician that will sit with you and help you make informed health choices for your family. Doctors with a “my way or the highway” attitude should be a thing of the past, but they are becoming very common. Use mineral balancing to heal from any current health issues, and as a preventative to help reduce your risk of becoming ill in the future. The best way to make a difference is to not support the companies that could care less about our health. Big companies like Johnson and Johnson have actually been proven to have products that cause cancer and other serious illnesses. So supporting small, local, organic, or fair trade businesses helps. The more people there are with natural lifestyles like this, the less “weird” it will become. Start to reduce EMF Exposure. EMFs are to blame for a lot of chronic health issues these says since WiFi is everywhere. Read my post on EMF Sensitivity to learn more. But remember: just do your best! The more changes you make, the easier it becomes to stick to this lifestyle. Especially when you start to see your family’s health improve. So let’s lose the fear of talking about this stuff. Maybe not today or tomorrow, but let’s work up to it. We’re lucky that we have so many websites like Moms Across America already talking about these truths. Want the sources on everything mentioned above? Read The New Normal in America. All sources are towards the end of the article. This is REAL. And we have the power to change it.